The findings are important because while wind power is generally regarded as green energy, danger to birds – particularly federally protected bald eagles and golden eagles – is a concern. Researchers have taken a key step toward helping wildlife coexist more safely with wind power generation by demonstrating the success of an impact detection system that uses vibration sensors mounted to turbine blades. Corresponding author Roberto Albertani and collaborators at the OSU College of Engineering and the College of Earth, Ocean and Atmospheric Science’s Hatfield Marine Science Center have created an integrated sensor system that can tell if a bird or bat hits a turbine. The system can also determine what species was involved in the collision. “If a turbine strikes a generic bird, sad as that is, it’s not as critical as striking a protected golden eagle, which could potentially trigger down time in turbine operations and losses in revenue, and most important the loss of a member of a protected species,” said Albertani, Boeing Professor of Mechanical Engineering Design at Oregon State University. The research by Albertani, College of Engineering graduate student Congcong Hu, and Robert Suryan of the Marine Science Center’s Department of Fisheries and Wildlife tested a conceptual design of a system that auto-detects collisions. The system features a vibration sensor at the base of a blade, an acoustic sensor on the generator housing to pick up bird sounds, and an optical camera on the tower base. Using a compressed-air launcher at the National Renewable Energy Laboratory Wind Technology Center in Boulder, Colo., researchers simulated bird impacts by firing tennis balls at turbines. Most of the detected strikes, he noted, occurred at the leading edge of the blade halfway between the blade’s midpoint and tip. The U.S. Department of Energy supported the research. Findings were published in Wind Energy. The department’s Office of Energy Efficiency & Renewable Energy is supporting Albertani on a related project to detect and deter approaching eagles as well as determine if a blade strike has occurred. Albertani is working with Sinisa Todorovic, associate professor of computer science at OSU, and Matthew Johnston, assistant professor of electrical and computer engineering, on what they hope will be a major breakthrough in a safer-for-wildlife expansion of wind energy worldwide. 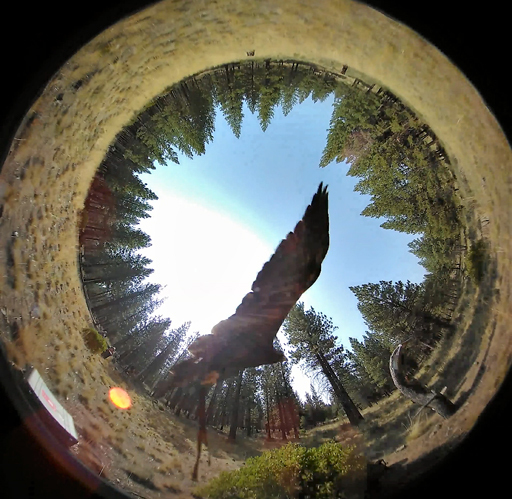 The idea is that a computer-connected camera would determine if an approaching bird is an eagle and whether it’s flying toward the blades. If both those answers are yes, the computer would trigger a ground-level kinetic deterrent: randomly moving, brightly colored facsimiles of people, designed to play into eagles’ apparent aversion to humans. When a vibration sensor detects a thump, recorded video data from the camera could be examined to tell if the impact was caused by an eagle or something else. Albertani’s team also includes two collaborators from the U.S. Geological Survey, biological statistician Manuela Huso and wildlife biologist and eagle expert Todd Katzner. An external advisory board includes Wind Energy industry representatives. The OSU College of Engineering is among the nation's largest and most productive engineering programs. Since 1999, the college has more than tripled its research expenditures to $37.2 million by emphasizing highly collaborative research that solves global problems. It is a leader in signature research areas, including precision health, clean energy, resilient infrastructure and advanced manufacturing; and targeted strategic areas, including robotics, materials research and clean water.